Now can the weekend please not fly by, that would be much appreciated! Before we get to pinterest recipes I have to share this with you, because cute puppies just melt my heart! Yesterday afternoon my Alma Mater Butler University unveiled the newest Butler Mascot! Throughout my four years at Butler our live mascot was the lovable and adorable Blue II. Blue II was a highlight of every basketball game and well loved icon on Butlers campus (he even gets a huge birthday party every year)!!! Well now Butler has a new cutie wandering around campus Trip the newest Butler Bulldog aka Blue III! Third in line to be the official mascot of Butler University! How cute is he (thats Blue II with him)!! Just look at that face! Such an adorable wrinkly face!! 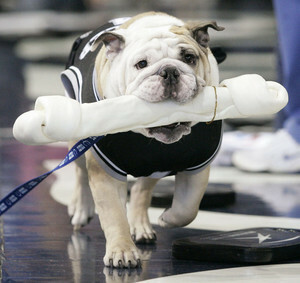 Trip will be making his Butler Debut along with the original Blue and Blue II at this Saturdays Men's Basketball game! I seriously wish I could be there to see that little cutie! Now that I have made you all want to run out and buy an adorable bulldog how about I share something tasty. Like two delicious recipes I made this week. Two more keepers off the pin board! Lets start with the Kick'in Chicken Chili! My dad made this chili Monday night for our families impromptu dinner party! We had Melinda and Mark over along with our family friend Renotta for a night of tasty food, relaxing and good conversation! The chili was delicious (and we made this salad again); just enough spice and packed full of flavor! This chili reheated great the next day at lunch as well! Always a win! My dad made the soup on the stove verses in the crock pot! This next recipe fueled my love for roasted vegetables! 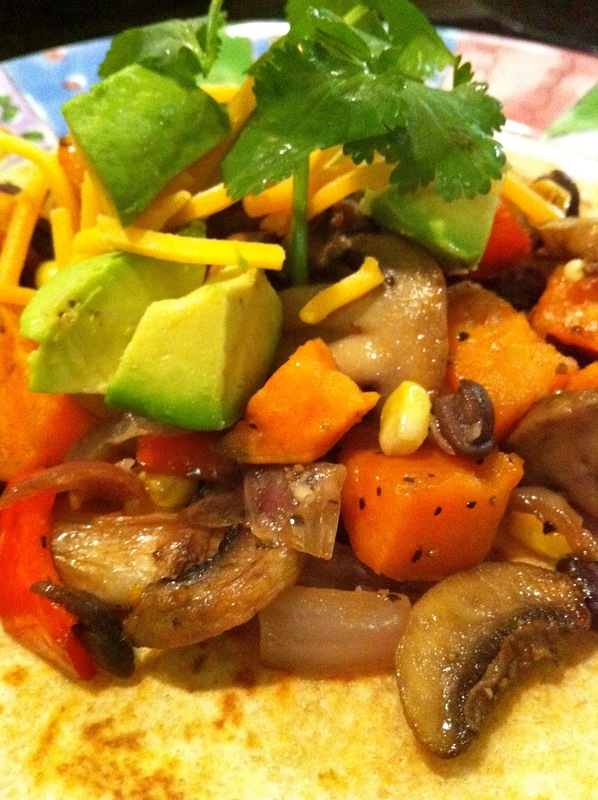 Roasted Garlic and Caramelized Vegetable Tostadas from How Sweet It Is! Wow, that word sums up this recipe. While this recipe takes sometime to prepare the time is worth it. Especially when each bite you take is a bit different depending on what vegetables you get! My favorite part of this dish was the roasted sweet potatoes and mushrooms! Love me some mushrooms! I hope you all have a fabulous and relaxing weekend! Yum! And that puppy is adorable! Those puppies are so cute, and I want to try the recipes! Thanks for sharing! I was dying over these pictures of Blue III yesterday! I can NOT wait to meet him!! I had the glorious luck of working with Blue II when I was at Butler...dream job! They are both just TOO adorable! happy long weekend... that is a great mascot to have! the pups are soo adorable...enjoy your weekend!! Caramelized vegetables have to be one of my FAVORITE things! I would love to try that recipe! YUM! I actually went to Butler high school in Matthews, NC, and our mascot was the Bulldog! I loved cheering for them :) And that chili looks amazing!! love it! enjoyed your blog!